This volume develops a novel approach to state theory. It offers a comprehensive review of the existing literature on the state and sets a new agenda for state research. 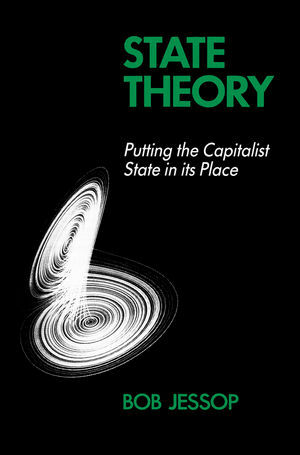 Four central themes define the scope of the book: an account of the bases of the operational autonomy of the state; the need to develop state theory as part of a more general social theory; the possibilities of explaining 'capitalist societalization' without assuming that the economy is the ultimate determinant of societal dynamics; and a defence of the method of articulation in theory construction. In developing these issues, Bob Jessop both builds on and goes well beyond the view presented in his earlier books, The Capitalist State (1982) and Nicos Poulantzas (1985). The result is a highly original statement which will become a center-point of discussion. The volume confirms the author's standing as one of the most important post-War Marxist state theorists. Bob Jessop is the author of several previous works including Thatcherism (Polity, 1988). Part I. On Marxist Theories of Law, the State, and their Relative Autonomy from the Capitalist Economy and Class Struggles:. 1. Recent Theories of the Capitalist State. 2. Recent Theories of Law, the State, and Juridico-Political Ideology. 3. Marxism, Economic Determinism, and Relative Autonomy. Part II. Political Representation, Social Bases, and State Forms: Corporatism, Parliamentarism, and the National Interest:. 4. Corporatism, Parliamentarism, and Social Democracy. 5. Capitalist States, Capitalist Interests, and the Rule of Capital. 6. The Democratic State and the National Interest. Part III. The Value Form, The Capitalist State, and Hegemonic Projects: From State Forms and Functions to the State as Strategy:. 7. Accumulation Strategies, State Forms, and Hegemonic Projects. 8. Poulantzas and Foucault on Power and Strategy. 9. The State as Strategy. Part IV. Putting States in their Place: Towards a Strategic-Relational Theory of Societalization:. 10. Anti-Marxist Reinstatement and Post-Marxist Deconstruction. 11. Societalization, Regulation, and Self-Reference. 12. Putting States in their Place. Selected Writings of Bob Jessop. Jessop's previous books have sold extremely well and this book will be essential reading.